Please inquire for a Quote - psorders@problemsolver.us The guiding trak is assembled and positioned on the floor to provide a smooth and level surface for the mobile units The end stationary units can anchor the system and the guiding track to the floor. Metro HD qwikTRAK units can hold up to 2,000 lbs. (907kg) per unit. HD qwikTRAK can increase the storage capacity of a given area by 30 percent to 40 percent. 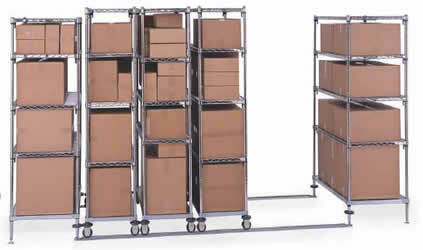 Mobile units are positioned between stationary units and a single aisle can be opened between any two units as needed. By moving the active aisle, HD qwikTRAK Storage System provides easy access to all stored products. Fully loaded units move with relative ease.